Today I am excited to share with you the new dresses that I have been working on! This is the Solis for Women from Sofilantjes. Do you have a dress that makes you feel like I do in this photo? I feel the joy my children do when they squeal with delight. I was also laughing because my neighbor caught me twirling outside in a dress. HA! The Solis is a dress that I have wanted for some time now! After releasing the girls version of this dress, Anne Jacobs, the designer behind Sofilantjes, received many requests to design this dress for women. I am so happy that she listened because I seriously am in love with this dress. I made three versions during testing and have 2 hacks for NURSING to show you today. The Solis pattern works for women with full busts that measure from 31.5 to 49 inches. It has 2 bodice options - an empire bodice or a natural waist bodice. This first dress is the empire bodice with a gathered skirt. The natural waist bodice additionally allows for a circle skirt or a pleated skirt. All views have optional pockets. The back of this dress is just genius. It works great with a racerback bra and keeps me so cool. Fabric. This first dress was made with a cotton lycra from Art Gallery called Powder Bloom. You can find it here. It is part of the Indie Folk Collection by Pat Bravo. For the bodice lining, back strap, and neck straps on the dress, I used pink cotton lycra from Made Whimsy. Fit Adjustments: I removed 1 inch of length from the skirt of the dress for my 5'2" height. I did an FBA on the bodice. I was slightly excited and terrified at the same time to do my first FBA. I normally am smaller chested, but thanks to nursing, I needed an FBA for the perfect fit. I loved Anne's instructions because the FBA that I did for all three dresses made me feel like a pro. It was very easy to do by just following her fit guide. 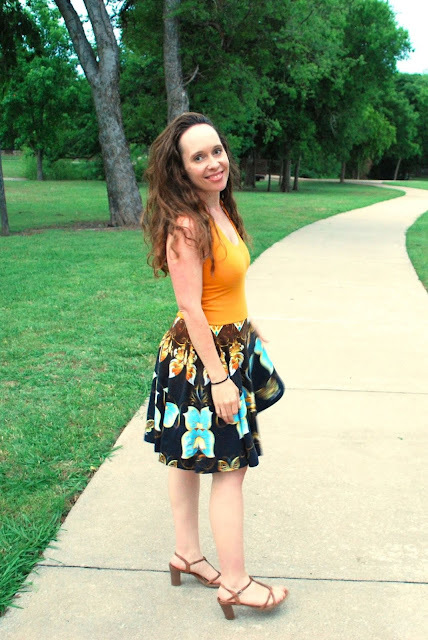 Pattern Modifications: The Solis has pattern markings to show you where to gather the skirt in the center of the front and back. I think the front gathers are super cute when you are pregnant, but for my postpartum body shape, I prefer more even gathers. So, on this dress I ignored the markers on the pattern for gathering and just gathered it evenly. I also modified the bodice so that I can nurse in it. 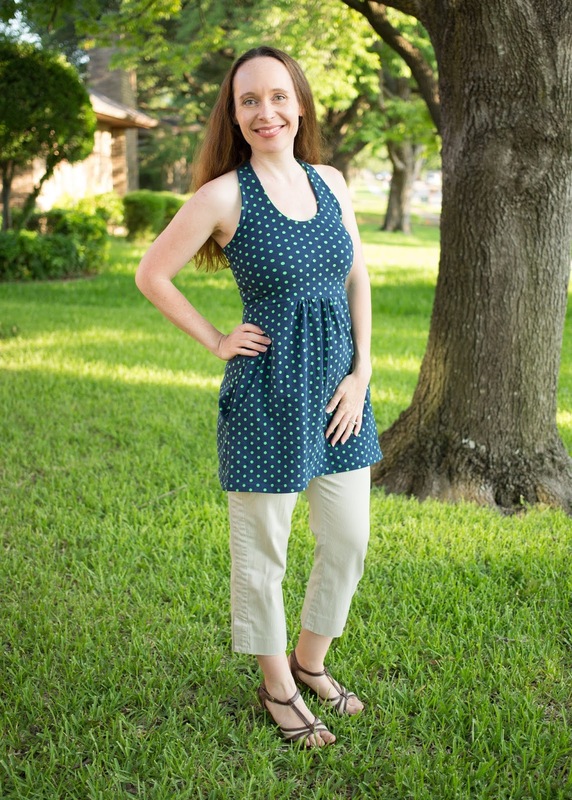 The empire bodice is very easy to modify for breastfeeding. The modification that I used is perfect for those who want to be more modest while nursing. (1) Follow the pattern instructions for assembling the bodice and skirt. However, make note of your lining fabric. If the wrong side of the lining is not pretty, you will not want it to show when you lift up the front overlay to nurse. To get the pretty side out, when you attach the bodice to the lining, put RIGHT side of front/back to WRONG side of lining (normally you would do right sides together so that the right side of your lining faces your skin). (2) Once your bodice and skirt are assembled, attach the skirt to the lining of the bodice only. This will leave you with the ability to pull the front overlay of the bodice up and down. (3) Finish the bottom edge of the top overlay. Measure around the entire bottom of the overlay. Take this measurement and multiply it by 90%. This will be the length of your band. I cut the band's width at 2.5 inches. Sew the short ends of the band right sides together. Quarter the bottom of the overlay, and attach the band much like you would a neckband. Match raw edges and sew. (4) Try your dress on, preferably with the bra you plan to wear with it. Take a marker or chalk and mark where you would like to have slits or cut outs for your underlay. Remember that a little goes a long way with stretchy fabric so you can always go back and cut more out later if you did not cut enough, but you can't add fabric back if you cut too much. Alternative: If you do not like the look of bands, you can make your bodice main front and back pieces an inch longer and keep the lining pieces the original length, sew 3/8 inch elastic to the wrong side of the overlay with a zig zag stitch or serger, turn the elastic under, and hem. I absolutely love this dress! It has a full circle skirt, a fully lined bodice, and feels so good to wear. I used a circle skirt panel from Smoogie for the skirt and mustard cotton lycra from Made Whimsy for the bodice front and lining. I used a different nursing hack for this bodice that is for those who would prefer to pull down rather than lift up. It is not as modest, but I actually prefer this hack the most. (1) When assembling the bodice, you will need to lengthen your neck strap by 3.5 inches. I did 4 inches, and ended up not needing quite that much length. Once you have lengthened your neck strap, iron a fusible scrap of interfacing on each end of the neck strap like this. (2) Sew the neck strap long ends together as instructed in the pattern. However, you will not attach the neck strap to the bodice. Instead, fold the raw edge to the inside and sew down each end of the neck strap like this. (3) Apply a scrap of interfacing at the top of the each shoulder on the bodice. Finish the shoulder ends of the bodice. Again, do not sew the neck strap onto the bodice here. (4) Turn your bodice right side out. Attach the neck strap to the back. Sew it down at the top so that it does not come out when nursing. This is what your bodice will look like, except you will have sewed it down horizontally across the top. (5) Put the neck strap underneath the shoulder top and apply a snap or button. Try it on to make sure you like the snap or button placement before applying. Finish the rest of your dress per pattern instructions. This version of the Solis is the empire bodice with tunic length skirt. This was my first make in testing. I wanted to make the pattern as written first to make sure everything worked for me and give good feedback to the designer before making any modifications. No modifications were needed (except my usual height adjustments of 1 inch out of the skirt) It is a complete winner, and I will also be enjoying this tunic in our hot weather. This one was made with a navy cotton lycra with lime polka dots from Riley Blake, and the lime bodice lining and back straps came from Made Whimsy. You can grab a copy of the Solis for women in English here. It is on sale now through Sunday at 4:55 p.m. CST (23:55 CET). The pattern is also available in French and Dutch. More Back Views!! Isn't Solis so pretty! 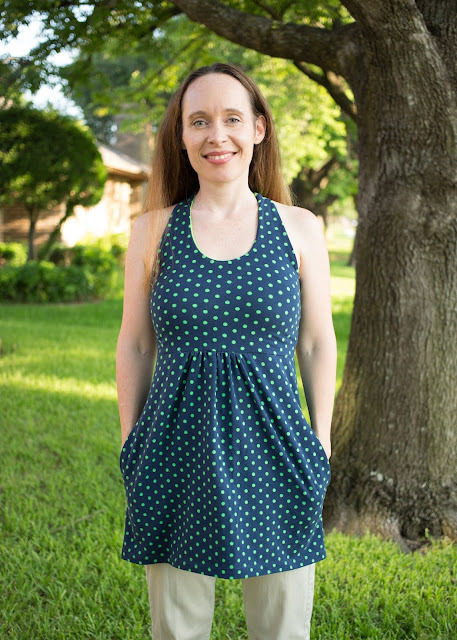 You made some nice dresses and a great hack! Great hacks, and so many dresses! Glad you liked the hacks!